When I started freelancing 5 years ago, I pretty much did everything wrong the first few times around. Actually, things haven’t changed all that much. I still make tons of mistakes and flip flop around when it comes to growing a studio business. But one thing I managed to learn well was the whole idea of “niching down” my services. This is a tough hurdle to overcome, especially early on in the journey. I had many overwhelming feelings throughout the process. Thoughts that I wasn’t good enough in one area to cut everything else. And I was unsure if I could find success offering only one or two signature services. Over and over again, I heard the same thing from successful creative freelancers. Specializing in one area is the best way to grow your client list and get good quality work. This may sound counter intuitive, especially if you are good at many areas. The logical response is to offer many services and cover a wide spectrum of clients. I followed this model for the first year of my business and I'll share with you why I decided to scrap it all and create my niche. Wowzer..that is a long list. I could do all these things to some degree (well, the writing service was my husband’s). But the problem was either my skills in each of those services were mediocre at best or I had little interest or commitment to go deep with it. I didn’t know a lot about web design, but I could create cool graphics. I have a huge interest in web development, but very little experience. I spent years building video game assets, but I was burnt out from that career. I should never have started offering this service in the first place. The most frustrating part of offering many services was trying to sell potential clients. Heck, I wasn’t convinced I could pull off half of these services - how was I so sure I could convince my clients! Sure, some clients signed up for me to do some web graphics and 2D illustration, but I didn’t feel awesome about it. And I really felt like I was hacking my way through various projects. Every meeting I had with a potential client took ages to prepare. Each service required me to ask different questions and dig into various areas of the client’s business. It was time consuming and sucked a lot of energy from me. With a niche service, I can set up systems for one offering, refine it with each project and get better at how I sell that service. I have refined a list of questions for our first meeting, I have email templates set up and proposals all ready to go. My elevator pitch is now 2 sentences long rather than a 5 minute run down of all my skills. Now, I look forward to meeting with potential clients because I have confidence. I know that my single product can help the right client - it's so much easier to sell. People want to put you in a category and know exactly what you do. This may seem frustrating if you have many skills. As artists, we all like to think of ourselves as "well rounded". But when it comes to building a business, you want to be attracting the right clients. And simplifying your offering is the quickest way to do so. With carefully selected portfolio items and limited services you will be seen as an expert in your field. This is fantastic since it will establish further trust with your audience. They will recognize your passion and dedication to going deep with one area. And your potential clients will be more likely to trust your ability to execute. With a focused service, more people find you through specific google searches. And even better, your network will refer you more often. 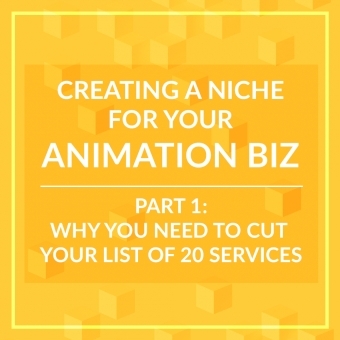 After all, it will be easy to remember the one service you offer - not the list of 20 things. Having only one or 2 services will force you to funnel your energy into getting super awesome at that one area. This doesn’t mean you are doing just one type of art style or animation skill for the rest of your life. Within your niche there is probably a wide range of interesting areas to explore. When I started offering Explainer Video services - I got a lot of whiteboard projects. This was fine, but they weren’t my favourite projects. So, I started exploring other styles of explainer videos. Because I was so focused on explainer videos, it was easy to branch out into other styles. Over time, I moved into 3D animation and then character animation. By sharing these new styles on my website, I was able to attract more work in those areas and shift to more interesting projects within my niche. The trick was moving into each style one at a time - not all at once which can spread you thin. But don’t fall for the myth that creating a niche is boring - think about going deep rather than wide. If you are offering too many services, going deep is not possible. You may find success with a wide variety of clients and projects. But you won’t have the opportunity to become an expert at one area in a short amount of time. Specializing my services was the best decision I made early on in my business. But it was also the most frightening, so I understand the hesitation you may feel. It feels un-intuitive to narrow down your skills and the transition will take time to find your direction. 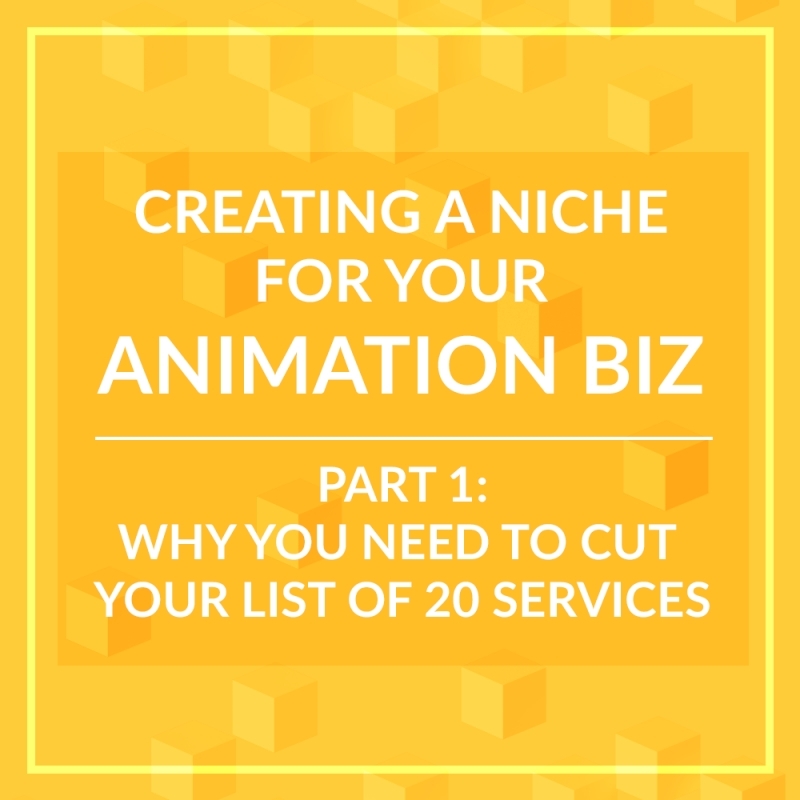 In next week’s post, I’ll focus on HOW to niche down your services. I'll share some of the lessons I learned along the way and continue to learn now. Because here is the surprising truth about specializing your services - the process never ends! Did you enjoy this content? Join my newsletter and you'll get updates on new blog posts straight to your inbox! Sign up below.